Foreign Minister Tilak Marapana visiting New Delhi from 8th – 10th September 2017, called on the Indian Prime Minister Narendra Modi and held talks with the External Affairs Minister Sushma Swaraj. National Security Advisor Ajit Doval called on Minister Marapana as well. 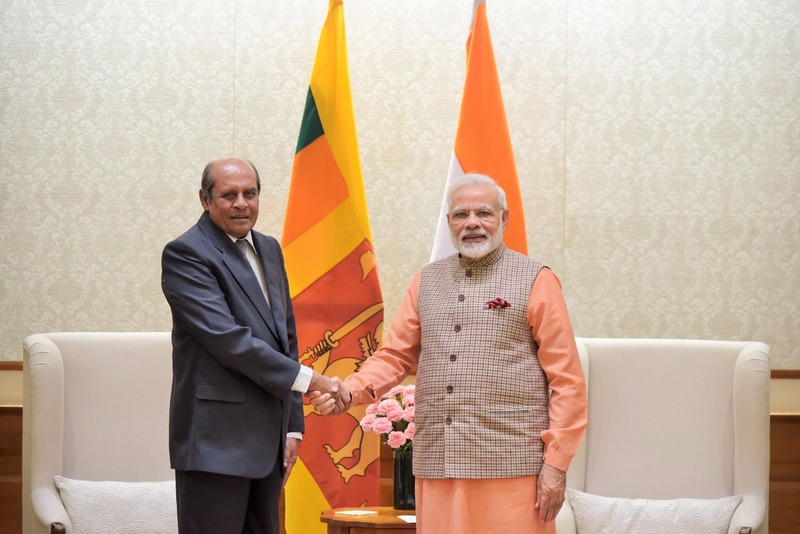 Foreign Minister Marapana conveyed the greetings of President Maithripala Sirisena and Prime Minister Ranil Wickremesinghe to Prime Minister Modi. Minister Marapana referred to the cordial relations that exist between the two countries as manifested by frequent high level visits fortifying close bilateral bonds. Minister Marapana reaffirmed his commitment for taking bilateral relations to greater heights. Prime Minister Modi while warmly welcoming the Foreign Minister Marapana stated that coming to India on his first overseas visit is a reflection of close partnership between the two countries. It was re-emphasised that as close neighbours, and more importantly, as the best of friends, India and Sri Lanka could continue to remain engaged and work together for the benefit of the two countries and the region. Prime Minister Modi renewed his assurances that India will stand by Sri Lanka’s forward march towards progress and prosperity. At the meeting between Minister Marapana and the Indian External Affairs Minister Sushma Swaraj, held at the Hyderabad House, the official venue for high level meetings, the two Ministers discussed and assessed all matters of mutual interest and in particular the implementation of economic cooperation projects. The meeting was followed by a lunch hosted in honour of Minister Marapana by Minister Swaraj which was also attended by the Minister of State for External Affairs of India Gen. V.K. Singh. Secretary of Foreign Affairs Prasad Kariyawasam, High Commissioner of Sri Lanka in India Chitranganee Wagiswara, Senior Director General of the South Asia and SAARC Division of the Ministry of Foreign Affairs Asoka Girihagama were associated with Minister Marapana at the meetings.